Ventilation - as an integral part of the life support system. Ventilation systems are the most important parts of life support, without which human existence in the room would be complicated or even impossible. But whether you need to buy special ventilation systems, if, as seems to be enough to open windows and fresh air coming into the apartment or office without any hardware? How many feel the presence of ventilation systems in large industrial or office facilities necessary, but in homes and small buildings are not required. Maybe so, but there are nuances that contradict this view. Natural ventilation brings in the room air, containing the unwanted impurities and particles that can cause various diseases of the respiratory tract. Also, such air is outdoor temperature, respectively, brings sudden temperature fluctuations in the location of people. To avoid such problems and there is a special ventilation equipment. We have a huge selection of high quality components for ventilation and the production of air ducts in accordance with all regulations. Everything we've learned that the ventilation in the apartment where we live, already exists and, after all, works. In fact, in apartment buildings carried out installation of a natural ventilation, which is only in the bathroom, toilet and kitchen. Required for the desired air supply and exhaust ventilation, which is absent in the flat. We get fresh air from the windows. He carries a variety of particles, including many harmful and dangerous, as its purity under great doubt. For a compact set of apartments supply and extraction, ensuring the necessary flow of fresh air and have clean air to all rooms apartment. Forced-air ventilation of the private holiday home is usually laid and are calculated at the design stage. To create not only the required general ventilation, and comfortable climate in the country house more likely to use central air conditioners that meet the parameters of temperature and humidity. At work, most of us spend almost half of all life. For a healthy labor badly needed fresh air in the proper amount. Ventilation in the office is necessary, but often it's just an open window, which does not meet standards and requirements for air exchange and quality. Nevertheless, in new or renovated office centers ventilation attach great importance and, consequently, in the offices of the required ventilation exists. Thus, at home, at work, in suburban homes - wherever required supply and exhaust ventilation! Manufacture of air is one of our activities, the company has its own plant for the manufacture of sheet metal ducts. We produce both standard products and non-standard. The company manufactures air ducts krguglogo sections and rectangular. 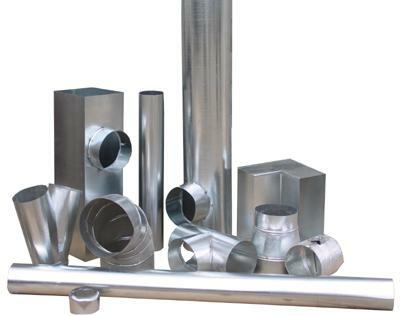 Experienced tinsmiths manufacture vent pipes and fittings (fasoninu) as soon as possible. Constructed from metal ducts of rectangular and circular ventilation system may contain a variety of shapes: bends at 90 and 45 degrees, the transitions from size to size and rectangular to circular cross section, and various crosses, tees and more. All these fittings for air You can also purchase from us. We should also dwell on the molded parts of the ducts. Round duct fittings made of metal - an essential part of supply and exhaust ventilation system. Used in ventilation systems, shapes are quite sharp turns, and the tees and crosses use a form of a direct tie-ins. And for aspiration systems, ie, dedusting air ventilation, molded products made from gentle taps: in such systems is the angle between the flow does not usually exceed 45 degrees. When using the flange connection duct between the flanges further pave the sealing material, and then make holes in the flanges and fasten them with bolts. Ducts differ from each other and by the way of what material they are made. However, as for any other equipment for air, there are standards of GOST, which our company strictly adheres to, thus allowing for the consumer long-term quality guarantee on all air ducts. 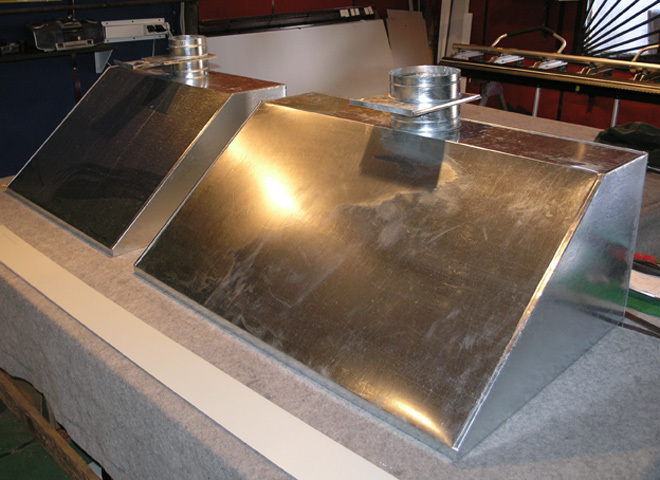 To date, galvanized ducts are in the leading position in the market of ventilation equipment. These ducts can be installed in homes and industrial premises. This popularity is not accidental - galvanized ducts have excellent technical characteristics. Our air ducts made of galvanized or stainless steel are first-rate durability because they do not corrode metal. All different-ducts, both in length and thickness of steel in the duct - it may be from 0,5 to 0,9 mm, depending on the requirements for you. It is also worth noting that our ducts possess remarkable ease, combining it with the strength, which would be the envy of many products of similar material. Ducts have broader scope. For example, you can use them to supply plant ventilation, as elements of the entire duct system and central air conditioners and much more.